For everyone one of us foreigners who gets a visa to live and work in the USA, there are thousands who go through a terrible, lengthly process with US Immigration and may never get their visa credentials. There was even a film made about the chronic visa issues entrepreneurs face when trying to get into the country, but these are not gun toting criminals; they are young, hardworking and well-educated entrepreneurs who want to create wealth and jobs in the USA. Whilst many industries are in steady decline in the USA, a glimmer of hope for prosperity comes in the form of the growth of Internet and technology companies in Silicon Valley. But now there is another option for entrepreneurs who want to come to build their startups in Silicon Valley: Blueseed. It’s a startup accelerator backed by PayPal founder Peter Thiel, and it’s creating a high-tech visa-free entrepreneurship and technology incubator on an ocean vessel in international waters. The facilities will be a short ferry ride away from Silicon Valley so that great ideas and talent from around the world can live, work, and play while having convenient access to the San Francisco Bay Area. Being 12 miles of shore means the ship will be in international waters and so normal visa restrictions do not apply. 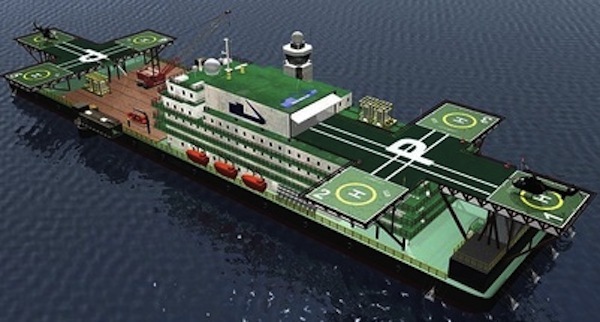 Building floating sovereign states or ‘Seasteading’ as it is known, is becoming a popular concept with entrepreneurs building various projects around the idea. You can see my interview with the Max Marty and Dan Dascalescu, the co-founders below and Blueseed featured on Fox Business News below.